Dubai is one of the most famous and most luxurious Gulf cities. Yet, it is extremely hard for us to imagine any Arabic city without having some traditional Arabic souks.The souk consists of over 300 retailers that trade almost exclusively in jewellery. Retailers in the souk include both well established stores like Damas, ARY Jewellery, Shyam Jewellery and Joy Alukkas as well as smaller stores that operate mainly in the gold souk. The Dubai Gold Souk is not only the center for shopping but also it is the Dubai centre of Gold Trading. There is no gold that you cannot buy here and several stores and companies deal with the selling of large quantity gold for smaller jewelers, 24k gold coins for collectors and 24k gold bricks for investors. Kaloti Jewellery is one of the biggest sellers of gold in the Middle East and India. 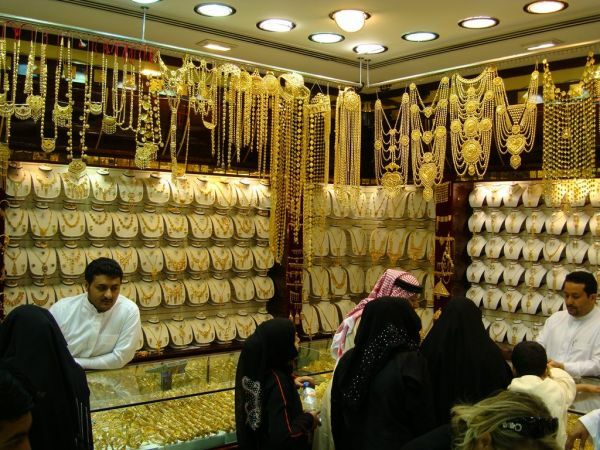 By some estimates, approximately 10 tons of gold is present at any given time in the souk. It is bordered to the north by the Dubai Fish and Vegetable Market and the Deira Corniche near Baniyas Square at Sikkat al-Khali Street which is walking distance from Deira Bus Stand. Dubai Gold Souk can also be reached by taking the Dubai Metro to Al Ghubaiba and a regular Abra (boat) from nearby Bur Dubai across the creek. The Dubai Gold Souk is 5 minutes walk from the Old Souk marine station. It's worth visit even if you have no intention of buying, just to soak in the atmosphere of shop windows glinting with 18, 21, 22 & 24 carat gold, showing-off the abundant riches of this part of the world. The sheer scale & variety of gold on offer is impressive - earrings, rings, necklaces, bracelets & pendants. Many different shades of gold are available: white, pink, yellow and even purple gold. Gold prices here are among the lowest in the World and are largely determined by weight; also varying depending on whether it is machine-made or by a craftsman.